The residents of Seongju and Gimcheon were caught off guard when the United States Forces Korea and the South Korean Defense Ministry forced key parts of the Terminal High Altitude Area Defense (THAAD) missile system into the former Lotte Skyhill Golf Course in the early morning hours of April 26. Many of the THAAD parts, including the AN/TPY-2 radar, are believed to have been transported into the deployment site. Below is video of Seongju residents showing outrage, shedding tears of anger and sadness, as riot police contain them and allow for military vehicles to pass through to the deployment site. 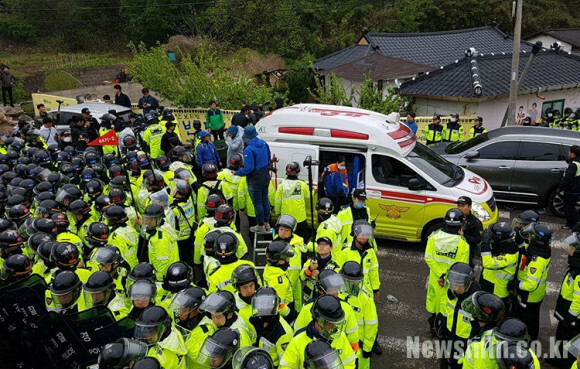 The South Korean government deployed 8,000 riot cops to forcibly remove the residents and Won Buddhist ministers peacefully protesting on the road leading to the THAAD deployment site. On two occasions, the police were able to clear a path for military vehicles carrying THAAD parts and equipment. At 4:45 AM, eight U.S. military vehicles entered the deployment site, and 30 more vehicles made their way in at 6:40 AM. 1:40 AM — 30 people, including members of the Won Buddhist Emergency Struggle Committee, joined by other religious clergy, began a prayer sit-in on the road in front of the village center of Soseong-ri. Village residents blocked the road to the deployment site with their cars. 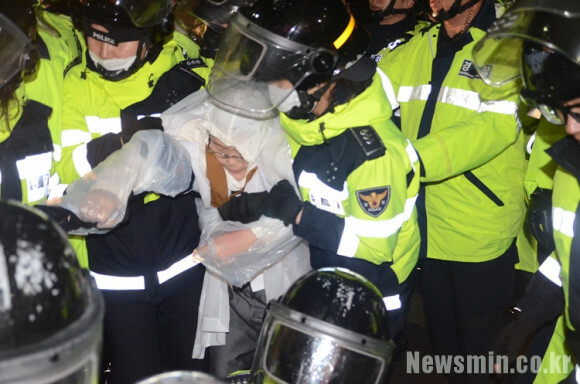 1:54 AM — South Korean riot police began to arrive at the protest site and surround the prayer sit-in. The police also blocked the protesters from communicating with other residents. They used excessive force to subdue several residents demanding the officers stop containing them. Several police officers threatened arrest against residents for blocking the road with their cars. 3:20 AM — The police issued an order of dispersal to the protesting residents. 3:40 AM — Immediately after the order of dispersal, the officers began to to use excessive force to break up the crowd. 4:05 AM — 30 Won Buddhist ministers were forced to disperse by the police. During the process, several protesters collapsed and lost consciousness. 4:13 AM — All Won Buddhist ministers were forcibly removed from the streets, and the road to the THAAD deployment site was cleared for the entry of military vehicles. 4:18 AM — Three injured residents were escorted to the hospital in ambulances. 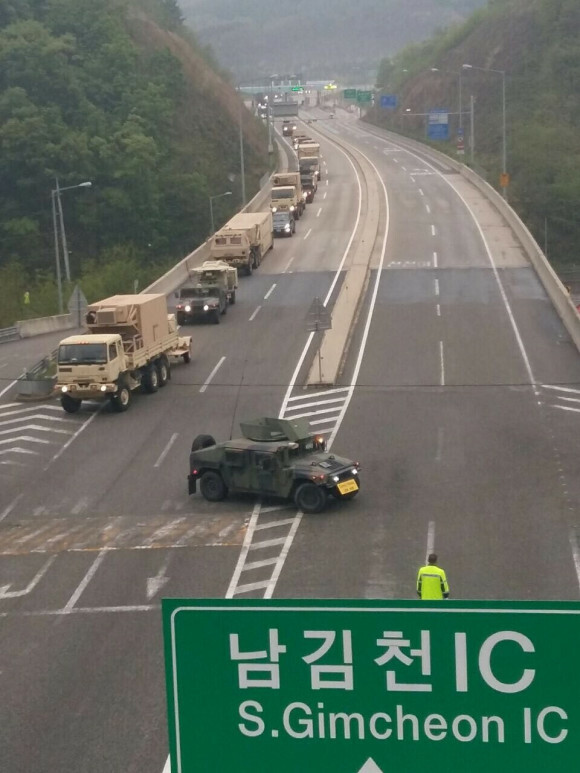 4:45 AM — Eight U.S. military vehicles carrying what appeared to be parts of the THAAD battery drove past the residents of Soseong-ri and headed to the deployment site. A group of 60 people, including Seongju residents, Won Buddhist ministers and Catholic clergy members attempted to block the entry of the military vehicles. The police, however, forcibly removed them from the road. 5:10 AM — 60 residents continued to protest near the Soseong-ri village center demanding the police withdraw from the village and the USFK stop the forced deployment of the THAAD battery. Residents chanted, “U.S. cops back off” to mean the South Korean police officers serve the interests of the U.S. and not the South Korean people. The riot police continued to block the residents from occupying the streets and obstructing the entry of U.S. military vehicles. 6:40 AM — Additional components of the THAAD battery were transported into the deployment site. 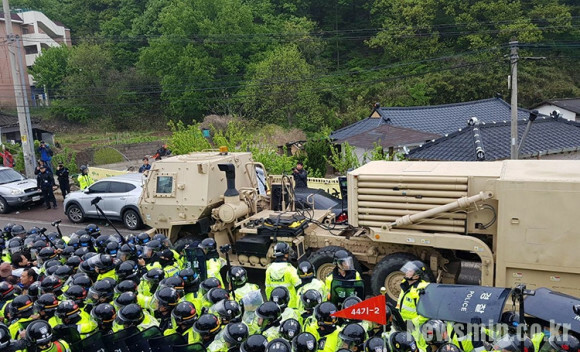 The riot police, again, suppressed the residents to allow 30 vehicles carrying additional THAAD parts to pass through Soseong-ri. At least six residents and Won Buddhist ministers were transported in ambulances to the hospital due to injuries sustained as a result of excessive force used by the riot police. 7:40 AM — 200 protesters gathered in front of the Soseong-ri village center to condemn the Defense Ministry for ambushing the peaceful protesters to transport key THAAD parts and equipment in the middle of the night. 8:05 AM — All police units pulled out of the village of Soseong-ri. 9:00 AM — A group of 100 people including residents and religious leaders held a press conference condemning the U.S. for forcibly deploying the THAAD missile system. The residents emphasized the lack of transparency surrounding the THAAD deployment and noted that there was never an official agreement signed between the U.S. and South Korean governments on the deployment. The environmental impact assessment has yet to be completed, they also noted, yet the key THAAD components have already been transported into the deployment site. The THAAD battery’s radar system — the AN/TPY-2 radar — was transported on April 26. From the start of their fight to oppose the THAAD deployment, Seongju and Gimcheon residents had expressed concerns about the electromagnetic waves emitted by the radar and their long-term impact on their health and agricultural crops. A total of 12 protesters sustained injuries and were escorted to the hospital in ambulances. The Defense Ministry reportedly told the South Korean media that it plans to transport the remainder of the THAAD components into the deployment site by the end of this year. Thanks for this. Power to the people! — but the power rests all too much with evil forces intent on dominating/controlling the landscape and the narrative….